Yes! This idea for a project came at a perfect time. Couldn’t have been a better timing. Really. I am in need for a radical diet and I mean it. The only way I can loose a few pounds is to eat porridge. A healthy, low carb – full of nutrients – diet. It keeps your stomach satisfied for many hours, unlike salad or fruit. And you also don’t have to force yourself to eat something disgusting like cayenne pepper lemonade… or blended broccoli and celleri juice… Basically, you really don’t have to worry about hunger attacks in between meals and believe me, you will loose your extra flabby parts around your waist or bottom in no time! The two best things about prorridge in my opinion, is the fact that you can add almost ANYthing into the porridge and it will always taste good. Second, you can it porridge for breakfast, lunch OR dinner! How awesome is that!!! The taste was fabuuuulous, by the way! And here is how it goes. Buy the Doenjang and Gochujang at a Korean grocery store. Wash and soak your rice in water for at least 1 hour. Wash the chives and slice them into thin pieces. Put aside. 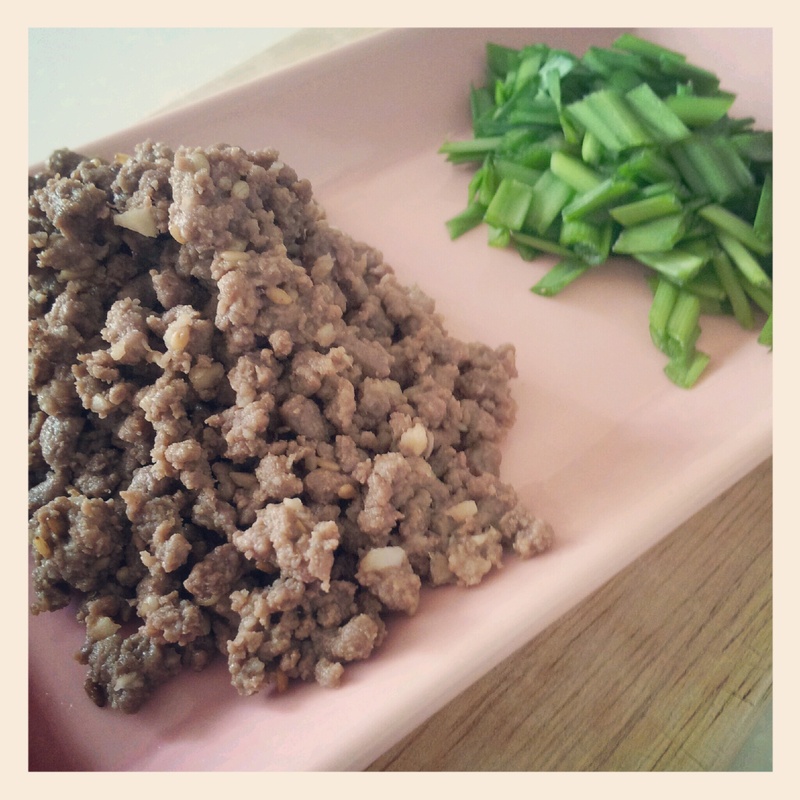 Mix the minced meat with the marinating ingredients. Put aside. In a large thick sided pan, heat up 1/2 tsp of sesame oil. Fry the minced meat in the pan and pour in the 7 cups of water. Dissolve the soy bean paste and chilli paste in the broth and bring to a boil. Add the rice and boil everything on low heat. When the rice is soft and the porridge has reached the consistency of your taste, add the chives, boil for 2 more minutes and then serve in a deep sided bowl. Chives – The spicyness and heat the chives produce helps strengthen your stomach and liver. It is rich in protein and vitamins and in addition, it keeps your stomach and intestines warm. 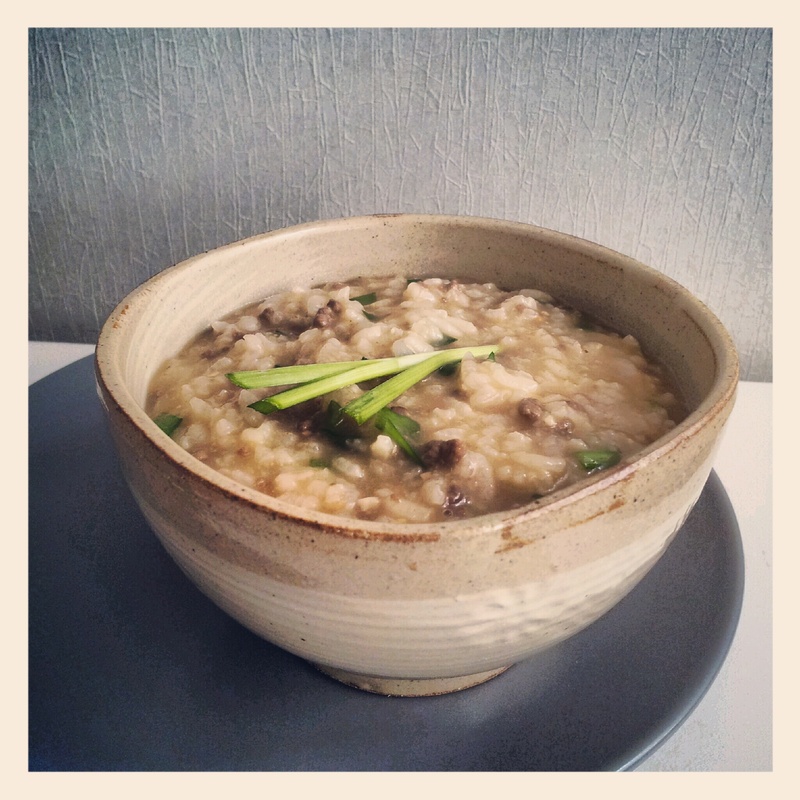 You are currently reading Porridge 1: Beef Soy Bean Paste and Chives Porridge at Healthy Home Cooking.